Creating a great house in which to raise children goes way beyond brightly coloured walls and novelty lampshades. For children, the home is their first experience of the bigger world, one that needs to be safe, comfortable – and fun to explore. Our environments shape us, and creating a home that is conducive to play, rest, and learning can have a big impact on our kids’ growth and health. Recent decades have seen a rise in play rooms and dedicated children’s spaces in the home. Across the western world, more and more children have their own bedrooms, dens, and games areas, arguably creating a disconnect within families. Here we look at a few ways in which architects have designed spaces that are child friendly, magical and fun, without compromising on an aesthetic and functionality that is adult-friendly too. In Stairs-House by y+m Design Office (above), a chunky timber staircase connects the main living room to an upper mezzanine. Crucially, the stairs are designed to be quite shallow, and are lined by bookshelves, allowing the staircase itself to double as a library and reading space for both the kids and their parents. Small changes in floor levels in your home can be exploited by creating a couple of deep steps that double as seats for kids to play or read, and can also assist the physical development of babies and young toddlers learning to ‘climb’ stairs. For older kids, loft beds are great for creating a feeling of privacy and sanctuary, and are perfect for creating storage or hang-out space underneath. IKEA do a great basic range. Likewise, hammocks and swings are simple ways to add a sense of adventure – make sure you allow for generous ceiling heights and the right structural support to accommodate these kinds of features. 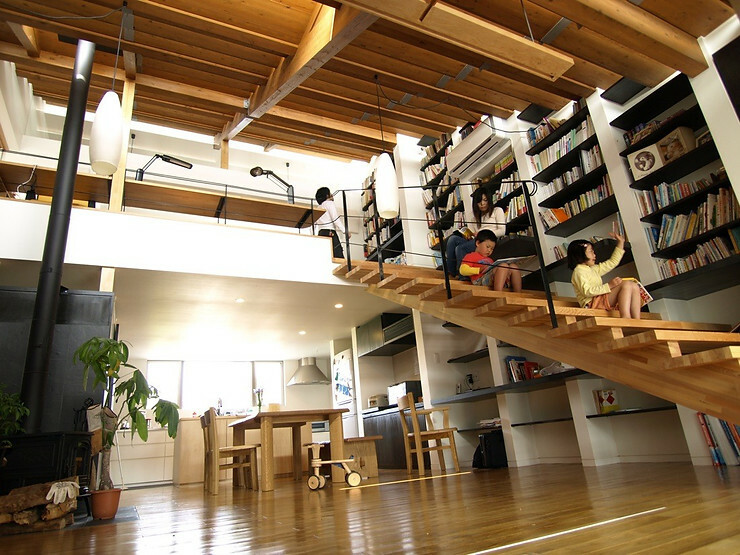 Take inspiration from the design for Loft 69 by Peter Ang (below). KI Design studio in Ukraine added the ultimate fun element of a slide to an otherwise contemporary and minimalist duplex apartment (below). However, you don’t need to be quite so bold to create great spaces for children. It is important to allow for quiet, cozy time for your kids too, as well as a little magic and intrigue. We love these secret places and reading nooks.